Looking for a family dessert with only 15 minutes of prep? 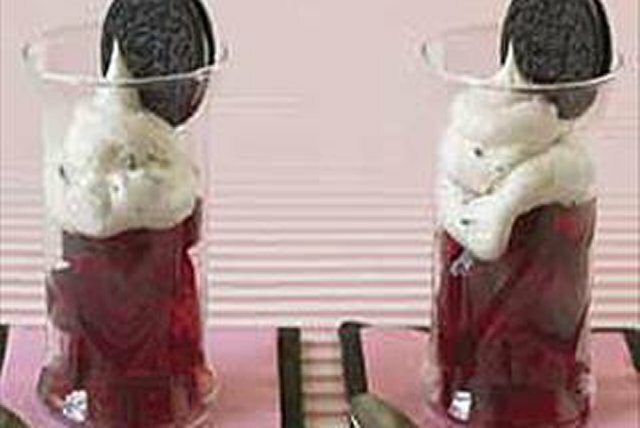 Top off cherry JELL-O with a creamy topping and the crunch of chocolate cookies. Dissolve jelly powder in boiling water; stir in cold water. Pour into 8-inch square pan. Refrigerate 2 hours or until firm. Chop coarsely 2 of the cookies. Add to whipped topping; stir gently until well blended. Set aside. Cut jelly into cubes. Spoon jelly cubes evenly into 4 parfait glasses; top with whipped topping mixture. Serve immediately. Or, cover and refrigerate until ready to serve. Top each parfait with 1 of the remaining cookies just before serving. This is an indulgent treat and should be saved for special occasions or shared with a friend. Serving Size Makes 4 servings.